Nearly two decades after winning the Grammy Award for “Fly, Robin, Fly,” composer Sylvester Levay was at a crossroads, about to venture into writing songs for musicals. “Writing music for (musical) ‘Elisabeth’ was around the time when I was peaking in Hollywood writing film music. I was torn between potential career choices when my wife pushed me forward. It was a turning point for me as a creator,” said Levay during an interview in Seoul on Thursday. The interview was in German, translated into Korean. Speaking about the piece that holds significance in his career, Levay said writing songs for musicals is meaningful in that it allows him to speak to the audience emotionally while being able to tell his own story from within. “Technical points of writing a song can be taught, but you can’t learn to write musical songs through books. Fundamentals can be acquired by studying, but the important thing is to tell the stories that live inside you,” he said. 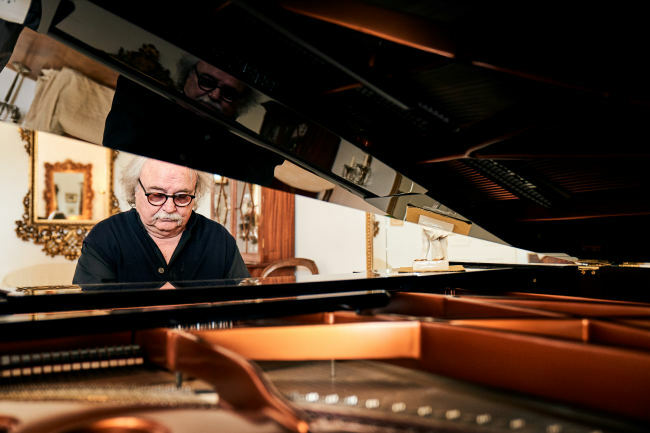 The Serbia-born Hungarian artist has a background in classical and jazz music, but began his career writing pop songs. He made his name writing film music before moving to musicals with “Elisabeth” in 1992. Levay is well-known in Korea for local productions of “Mozart!,” “Rebecca,” “Marie Antoinette,” and “Elisabeth,” which runs at Blue Square Interpark Hall in Seoul until Feb.10. “I had absolutely no pressure when I wrote songs for ‘Elisabeth,’ because it was my first musical. There were no expectations. After its success in Vienna (production), however, there were expectations,” he said. Levay said that one of the reasons he has been motivated to work on “Elisabeth” is the respect he has for Empress Elisabeth of Austria. He said the material on the empress that his wife had helped him to view Elisabeth as a person, rather than just a historical figure. With his first musical entering the 26th year since its debut performance, Levay said the piece has evolved over time. He said the Korean performance appears to retain its classical base, along with the addition of a modern touch. He also mentioned that the prowess of the main cast, including K-pop star and actor Kim Jun-su, has been crucial in the quality of the performance. Kim, playing Death or Der Tod, has been gripping the audience with his captivating performance. “I loved that he maintains the dramatic tone in the performance, mixing tension and the sense of menace while retaining a romantic feeling toward Elisabeth,” he said of Kim’s performance. Ok Joo-hyun, Kim So-hyun and Shin Young-wook are playing the leading lady, and Park Hyung-sik and another K-pop star and actor Jung Taek-woon have been cast for the role of Der Tod. Speaking about potential follow-ups to his popular musicals, Levay said he is currently working on one or two projects dealing with “special subjects” that he is certain will be a hit in Korea. “Elisabeth” is available to those 8 years old and above, and is 170 minutes long. Tickets range from 70,000 won to 140,000 won. For tickets and more information, visit the homepage https://www.musicalelisabeth.com.